What the Heck is Ranch Water? You can belly up to any bar in West Texas, whether it’s a dark dive or a glamorous hotel, and, without even glancing at a menu, order a ranch water. Heck, these days, you can do that at pretty much any bar in Texas. The simple cocktail has developed quite the fan base, and it’s led to contested origin stories and bubbling debate about the proper ingredients. While the eminently drinkable cocktail (it’s no coincidence “water” is part of the name) is widespread in Austin and San Antonio, ranch water may taste best in West Texas, a land of big skies, blazing days, cool nights, and slow pace. The simple cocktail has developed quite the fan base, and it’s led to contested origin stories and bubbling debate about the proper ingredients. The basic building blocks of ranch water are lime, tequila, and carbonated water. They can be upgraded, downgraded, or substituted depending on your mood and what you might have lying around the bar. Some people swear by using Topo Chico, the Mexican spring-sourced carbonated mineral water, which the Coca-Cola Co. bought in 2017. 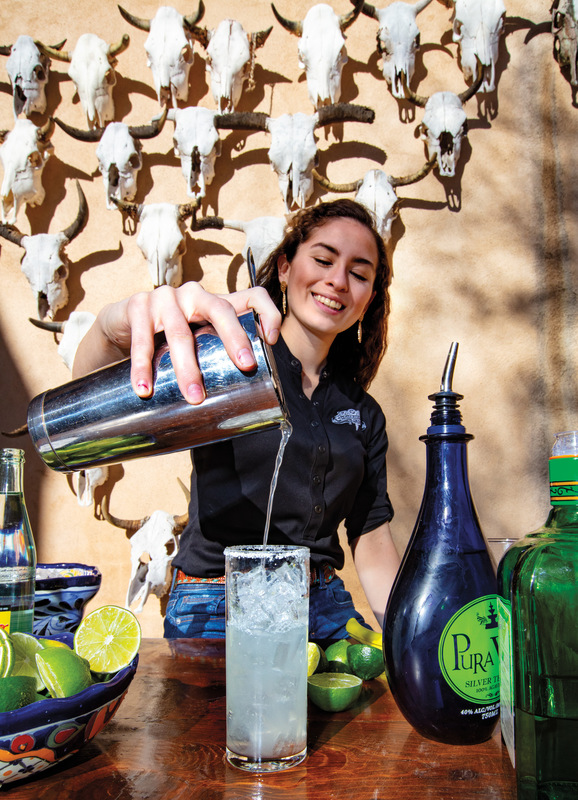 “It comes out crisper—Topo has really distinctive bubbles,” explains Corazon Maxwell, Terlingua native and bartender at the local Starlight Theatre. The Capri at the Thunderbird Hotel in Marfa uses a different brand of bubbly water: Tehuacán Brillante, also from Mexico. “The drink itself is a very, very t­­­raditional Mexican cocktail,” Capri bartender Joseph Lawrence says. Ranch water isn’t just the domain of mixologists—it’s what West Texans whip up at home, too. Terlingua resident and archaeologist Tim Gibbs serves up ranch waters for friends who stop by his Chihuahuan Desert home in the summertime. His version has 12 ounces of carbonated water to 1 ounce of tequila, the juice of a key lime, and a salted rim. “I like mine with a lot of fizzy water to make it more sessionable on hot summer days,” he says. Ranch water’s origins remain a bit murky. Some stories hold that it first appeared in Marathon, at the Gage Hotel’s White Buffalo Bar. General Manager Carol Peterson says ranch water has been on the bar’s menu as long as she’s worked there, about 15 years, or possibly longer. In Austin, however, Kevin Williamson, owner and chef of bar and restaurant Ranch 616, claims his eatery was the first to dub the drink “ranch water,” in the same time frame. Williamson is in the process of trademarking the name “Ranch Water” and is considering bringing the drink to store shelves in the future. Given its simple ingredients, it’s probable bartenders have been mixing versions of the cocktail since the glory days of swinging saloon doors. No doubt the ingredients have varied over the years. The versions created by the Gage and Ranch 616 both include orange liqueur, making it taste more like a less-sweet take on a margarita. But orange liqueur is not a widely accepted ranch water ingredient, especially in today’s market of high-end tequilas. Jerram Rojo, bar manager at the Capri, says bartenders originally mixed orange liqueur in margaritas because only poor-quality tequila was available, and they had to do what they could to salvage the flavor. With finer tequila spirits such as Espolón Blanco (see sidebar) more easily available now, that’s no longer a problem. While a lot of things about ranch water are up for debate, the refreshing, entirely customizable drink is delicious—and that’s something cowhands and city slickers alike can agree on.